Have you ever wondered what the Gods would play if they had a sport? Well, the Aztec and Mayan civilizations played a brutal ball game representing their deities’ eternal struggle for supremacy. In Ulama: Arena of The Gods, you get to experience what the game would be like if those Gods themselves played it! 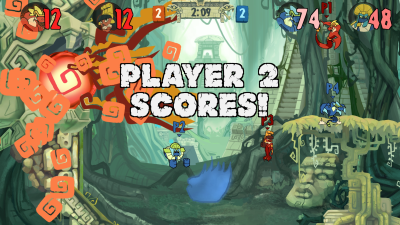 Ulama: Arena of The Gods is a mix between a 2D brawler and a team ball sport. 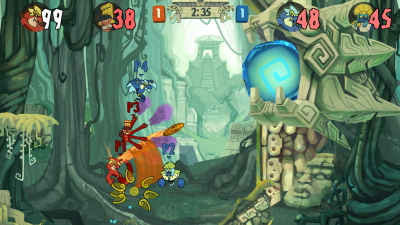 In it, players form into teams and pick their characters from a roster of the Aztec pantheon. Then they duke it out in the ball court to score the most goals on the opposing team’s portal, hopefully beating their rivals senseless in the process! Each character has unique characteristics and abilities that the player will be able to combine with her teammates’ to do awesome plays or knock her opponents right off the stage. We're developing this game as part of the Masters in Games and Playable Media program at UCSC with the help of artists from SJSU and audio designers in various countries. We are making it with the Unity 5 engine in C# and has been in development since January 2016. Ancient civilizations played a brutal ball game representing their deities’ struggle for supremacy. Now you get to experience it in this 2D brawler and ball sport mix. Players pick their avatars from a roster of Aztec Gods and duke it out in the ball court to score the most goals on the opposing team’s portal, beating their rivals senseless in the process! Ulama combines the fast-paced action brawling of your favorite party games with the strategic competitiveness of your sport games of choice. Our game is a mix between a 2D brawler like Smash Bros, Lethal League or Towerfall Ascension and a ball sport like Rocket League, IDARB or NBA Jam. In Ulama, though, you’ll have to balance combat and ball play strategy to come out victorious. This, combined with the stylized Mesoamerican aesthetics, gives the game a novel spin on the party games that have become the favorites of thousands. You’ve gotten together with your friends for a night of gaming and can’t agree on whether to play FIFA or Smash Bros? How about a bit of both!? Ulama combines the fast-paced action brawling of your favorite party games with the strategic competitiveness of your sport games of choice. Hours of local multiplayer action that will always keep you coming back for “one more match”. Which plaforms is it on? Right now Ulama will be available for PC through Itch.io and Steam, and we hope to get it to Linux, Mac, and Xbox One very soon! Ulama: Arena of The Gods is scheduled for release Q3 2016. We are a handsome group of developers, Pedro Cori, the creative director, Alexander Formoso, our producer, and Cong Liu, the resident code ninja. We’ve been gathered by fate in the UCSC Games and Playable Media masters program when the team formed to bring the concept of Ulama: Arena of The Gods to life. The inspiration for the game came from the stories about the Aztec and Mayan mythology that Pedro’s father related to him when he was a child, and that he still keeps today in an old illustrated book of stories. The talented artists from SJSU have worked with us to make the gorgeous graphics you see in the game, and sound designers from AAU and Chile to complete the theming in music and audio.